Service Robotics Market Size « Global Market Insights, Inc.
Powered by the robust industrialization trends, service robotics market has been escalating at an astonishing rate over the recent years. The technology has established its stance as an interface between industry and service sector and has garnered a mass popularity across a plethora of domains like defense, healthcare, entertainment, household, and logistics. If reports are to be relied on, the commercialization matrix of the business space has taken a prominent turn in the recent years, courtesy – the significant proliferation of IoT, cloud, Artificial Intelligence, and machine learning. In fact, as per estimates, global shipments of service robots surpassed 7.5 million units in 2016 and is further anticipated to witness a remarkable y-o-y growth of 20% over 2017-2024. The introduction of service robots in logistic operations is deemed to be one of the most significant qualitative shifts in this domain. The paradigm transition in operational interlinking is undoubtedly bringing new opportunities for service robotics market from logistic application. Autonomous Guided Vehicles (AGVs) is one of the finest examples of the robotics breakthroughs in logistics sector. AGVs can reportedly be operated without much human intervention and are significantly increasing the safety quotient of the automobile. With further enhancements in this technology, the sector has witnessed yet another revolution – AIVs (Autonomous Intelligent Vehicles), enabling greater autonomy, longer battery life, and more flexible & scalable robotic system. Increasing deployment of such robots in indoor as well as outdoor logistics applications for ensuring a better operational efficiency has in turn, fueled service robotics industry growth. Estimates claim that logistics applications contributed over USD 1 billion to the global service robotics market landscape in 2016. 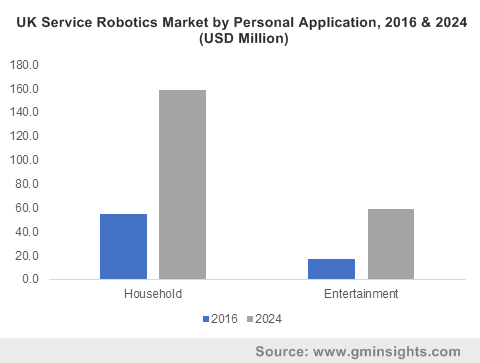 The personal sector has turned to be another prominent application vertical for service robotics market, especially with the increasing deployment of household and entertainment robots. Rising penetration of vacuum cleaners, lawn cutters, and other similar robots for carrying out the tasks that are often routine for humans, has been identified as a turning factor uplifting household service robotics application. In fact, as per estimates, personal applications accounted for 36% of the overall service robotics market size in 2016. With advanced technologies like speech, emotion, and facial recognition features coming onboard, this particular business vertical is likely to tread along a lucrative growth path over the ensuing years. Elaborating on the tech intervention in household sector, the contribution of iRobot Corporation, one of the leading names in the robot cleaning world, is worth mentioning. The company has always been at the front page with its continuous adoption of advanced technologies for enhancing consumer experience. It has recently introduced its iAdapt 2.0 Responsive Navigation system that is integrated with Alexa –strongly emphasizing on voice as a better interface than touch. Reportedly, the vacuum cleaner not only recognizes voice or speech but also has the capability to digitally map the interior of house while cleaning the floor. As per analysts’ speculation, the birth of such groundbreaking technologies is bound to lucratively drive the product terrain of service robotics market over the coming years. Speaking of the competitive landscape, service robotics industry is highly fragmented in nature with the participation of leading players like Parrot SA, 3D Robotics, Softbank Robotics, AeroVironment, Inc., DJI, Intuitive Surgical, Inc., Bluefin Robotics, and Samsung Electronics. Quite conspicuous from the aforesaid trends, these industry participants are increasingly focusing on developing technologically advanced products with enhanced functionalities in tandem with the tried-and-tested growth strategies such as R&D, collaborations, M&As, and product expansion. All in all, with organizations progressively looking to tap into the power of robotics for customer service, the global service robotics market is certain to bag massive proceeds in the years ahead. The presumption is aptly validated by Global Market Insights, Inc.’s forecast which claims service robotics market share to exceed a valuation of USD 22 billion by 2024. This entry was posted in Sustainable & Smart Technologies and tagged Personal, Professional, Service Robotics Market, Service Robotics Market Companies, Service Robotics Market Forecast, Service Robotics Market Report, Service Robotics Market Share, Service Robotics Market Size, service robots.